One of the distinctive features of many London squares and terraces are the black metal stubs on house walls and steps, where metal fences were cut down to provide scrap metal to make weapons during the Second World War. In his recent fascinating book, Waste into Weapons: Recycling in Britain during the Second World War (Cambridge University Press), Peter Thorsheim describes how these recycling drives affected many other materials, including paper and books. Paper was an important ingredient in such wartime products as land mines, bullet cartridges, shipping containers, radios and of course propaganda and information posters. 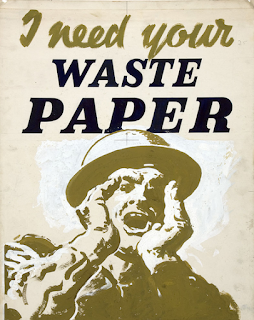 The demand for paper was immense throughout the war. Thorsheim reports how in September 1941, Princess Elizabeth (the future Queen Elizabeth II) made a broadcast congratulating the people of Britain for contributing 400,000 tons of waste paper to the war effort, but she explained that more was needed: ‘Tucked away in our bookshelves and cupboards and offices there are masses of books, magazines, old business records, and papers of every sort laid by in case they may be wanted some day. That day has come! Your country wants them now. Keep your family Bible of course and anything of historical or special value; but from the rest you can each contribute your special share of the ship loads that these old books and papers would save’. (Thorsheim, pp. 184–5). Officials were keen to help out by identifying waste paper in official archives. Local councils were urged to release for repulping all papers and books which it was not necessary to retain. Sir William Davison MP noted the ‘vast accumulation of ancient files of papers’ held by government departments and declared that wartime provided a perfect chance to get rid of all this useless clutter. Despite injunctions not to destroy material of historical significance, many financial records created by the East India Company were pulped. In deciding to recycle all correspondence of their Education department over ten years old, Aberdeen Council decided specifically to ignore any historical interest of this material. Surrey County Council proposed to pulp most of its papers and documents which were more than three years old. The destruction was not limited to public authorities. In January 1941, The Times cleared nineteen tons of ledgers and other business records from its offices. (Thorsheim, p. 186). In 1942, King George VI donated to a waste drive more than a ton of waste paper, consisting of a ‘large consignment of old books and manuscripts from the royal library’. The drive to recycle every scrap of paper was so intense that it was even suggested that blank endpapers should be cut from books. (Thorsheim, p. 184). Thorsheim suggests that the destruction caused to Britain’s libraries and archives by these salvage paper drives was worse than that caused by enemy action. Voices of protest were raised. The bookseller W. Foyle lamented that ‘many priceless, rare and irreplaceable books’ were being destroyed, and described how recently he had identified in material sent for waste ‘a perfect copy of von Gerning’s Tours along the Rhine with colour plates by Ackermann together with other fine books’. The archivist Joan Wake said the destruction of records was being undertaken with a Teutonic thoroughness, stating that ‘If English history does not matter, all this destruction does not matter in the least and the sooner we boil down the Domesday Book to make glue for aeroplanes the better’ (Thorsheim, p. 182). Joan Wake was speaking at a meeting of the British Records Association, which took the lead in trying to minimise the damage to historic archives caused by the wartime paper drives. The British Records Association had been founded in 1932 and took over work on records preservation which had been begun by the British Records Society three years previously. Changes in legislation concerning land tenure meant that solicitors no longer needed to retain many deeds and other records relating to property, and there was a risk that much of this material would simply be destroyed. The Records Preservation Section of the British Records Association offered a free service for appraising and sorting such records. This work has continued to the present day, and hundreds and hundreds of endangered records and historic papers have been saved by the work of the British Records Association during this time. Much of this early rescue work by the British Records Association was undertaken by volunteers and historically the British Records Association has always been an inclusive body welcoming as members anyone interested in archives. While the Sociey of Archivists (now the Archives and Records Association)has taken the lead in the UK in professionalising the management of archives and in representing the interests ofv archivists as a profession, it has always been the British Records Association which has represented everyone with an interest in archives, such as owners of records, university scholars, family and local historians, and local councillors. Apart from its records preservation work, the British Records Association organises a well-supported conference, publishes an excellent journal Archives(recently spasmodic in appearance, but about to issue a chunky double issue) and produced a very useful series of handbooks called Archives and the User which includes such indispensable introductory volumes as Paul Harvey on Manorial Records, Elizabeth New on Seals and Sealing Practicesand Nat Alcock on Sources for the History of Houses. I was Treasurer of the British Records Association for ten years from 1984 to 1994, and I was immensely saddened to hear that it is currently proposed that the Archives and Records Association should take over the British Records Association. It is suggested that there is a need for a single voice to speak for archives. I fear I don’t agree. The ARA was established as a professional association and it is still dominated by professional concerns. Unlike the British Records Association, the ARA is not open to anyone interested in archives — only working archivists can become full members, but others can only become affiliate members. Can we be sure that professional archivists will indeed speak out on key issues affecting archives nowadays? To my mind, our modern equivalent of the risk from the wartime waste paper drives is the digitisation and effective commercialisation of vast swathes of public archives by companies such as Ancestry and Findmypast. Professional archivists, anxious to demonstrate that their archives are fully up-to-date and go ahead, are often complicit in this process and enthusiastically sign up with Findmypast and others, somehow believing they are increasing access. We need a body that is distinct from the archival profession to speak out and act on such matters. The British Records Association could be such a body, as it was during the Second World War. When I visit any archive nowadays, it is full of family historians who are clearly enjoying their engagement with the records and would be keen to help preserve records and make them more widely available. The nature and significance of the archive is a fashionble research subject among a wide range of literary and historical scholars in the wake of Derrida’s and Foucault’s speculations on the matter. Archives as institutions seem more vibrant than ever. Surely there is scope for an inclusive, outward-looking advocate for archives which seeks to develop as wide a membership base as possible? I am not convinced that the ARA, bowed down with the pressing professional concerns that affect many archivists, can grow into such a body. The BRA could become such a body, but it will need to stop resting on its wartime laurels, and take some hard decisions. It will need to become a low subscription, high membership body (as it was in the 1930s). It will need to become a less London-focussed and more regionally based body. It should become a prominent voice of UK archives on social media (there is no such voice at present) and should forge links with other constituencies, such as the digital humanities). It should create an innovative open access journal to replace Archives. Its handbooks coulds be freely available on the web. While digital media have made it easier than ever to engage with archives, paradoxically the archives community seems to be becoming more inward-looking and less willing to engage with the full range of those who are interested in and enthusiastic with archives. Help change that by saving the British Records Association. “The British Records Association brings together in equal partnership, all those with an interest in archives and their use, to explore and highlight their value to the research and wider community and the importance of their preservation. The membership consists almost equally of individuals and institutions, and includes historians, historical and research groups and institutions, custodians, and owners of archives. The BRA provides a forum for direct dialogue between its members to promote the use of archives, as evidenced by its highly successful annual conference. -the next ‘In a League of their Own’, is on 26 November http://www.britishrecordsassociation.org.uk/events/annual-conference-26-november-2015/ . It also plays a vital role in raising the profile of archives through its publications, including the authoritative journal, Archives. There is now the threat of a take-over by the Archives and Records Association (ARA). Following a Council meeting, a proposal to abolish the organisation and transfer its functions and assets to the ARA is to be put to an Extraordinary General Meeting on 18 November. A group of concerned members believe this action is not in the best interests of the BRA or of the wider research community. The BRA has the membership, ability and finances to continue to be a viable and useful body. Members now face a vote which could bring an end an organisation which has existed since 1932 and deprive the research and archives sector of an important independent voice. So — if you are a member of the British Records Association, come along on Wednesday at 2pm at Swedenborg Hall in London and make your views known. If you are not a member of the British Records Association, but would be interested in joining a revived and reformed BRA, please write to me or to Julia Sheppard. Six months ago, at Bronwen Thomas’s suggestion, I submitted a guest entry to the blog of the Digital Reading Network, which I called ‘My Acts of Reading’. In the entry, I tried to describe my relationship at different points of my life with reading. The importance of reading as a social and cultural activity is illustrated by the way in which so many of our memories are bound up with it. I am sure many of us remember our parents reading to us or the excitement of first gradually mastering how to decipher a book. One of my most vivid memories of Christmas is of a bitterly cold day in the 1960s - opening my presents, finding a book there, and going back to the warmth of my bed to read the book. For most of us, reading is bound up with our very personality. By changing the nature of our engagement with reading and writing, digital technologies are transforming some of the most fundamental and distinctive features of human behaviour. Another vivid reading memory is from 1993, when I was shown the World Wide Web for the first time by Tim Hadlow, the remarkable Systems Administrator here in the British Library. The way in which the web combined text and image in new configurations made it obvious that here was something that was going to change much of my intellectual and cultural world. I was very pleased to be part of the team which, under the leadership of another remarkable librarian, Graham Jefcoate, helped put together the British Library’s first website ‘Portico’. I became involved in a number of projects for digitisation of manuscripts, particularly the Electronic Beowulf. In those early years, digital images and text were a specialist tool that one used at work for formal research. This began to change as JSTOR arrived and more academic journals became available online. From about 2000, I began to notice how more and more of my reading was taking place online and increasingly this online activity was not just simply at work. The point, in about 2006, when printed newspapers became a weekend indulgence was a significant landmark. However, I held out for a long time against reading books online. Although one of the strategies I adopted as a librarian at Lampeter in west Wales to deal with high levels of student demand for particular books was to buy e-books, for my own reading, both academic and leisure, I tended to prefer an old-fashioned printed book, notwithstanding many friends urging the virtues of a kindle upon me. The change occurred for me last year when I was reading Mark Ormrod’s monumental biography of Edward III. Mark’s book is a wonderful piece of historical writing, but Edward III lived for a very long time and this biography is a very big book. Carrying the large book around was beginning to give me a backache. I really couldn’t face carrying the printed volume around any more, and purchased the e-book to read on my ipad. It was a revelation. I found I got much more pleasure from reading the e-book than from reading the printed volume. This wasn’t simply due to the convenience and simplicity of the e-book - something about the backlighting of the text and the physical nature of the tablet seemed to encourage me to read more. My reading became rebooted. So, my blog entry for Bronwen describing my late conversion to e-books was six months ago. How have things changed? Do I still feel that the e-book has transformed my acts of reading? Certainly, my e-reading enthusiasm continues unabated. My home is in a remote part of west Wales, but the rural buses have recently installed wi-fi, and it is wonderful that, if I finish my book during a bus ride, I can download another. But I suppose, after six months, I do have other more critical reflections on my e-reading. 1. There are limits to my e-reading. I described in my original blog how I find I still need to transcribe medieval documents if I am to use them effectively in my research. For my leisure reading, I find that poetry still seems for me to work better in print - maybe because like whisky it needs to be sipped. 2. Although most of my everyday reading is now electronic, my academic research is mixed medium. Some of the books are use aren’t available digitally, but the biggest barrier to my more extended use of e-books in research is that academic books are so tremendously expensive, no matter whether they are printed or electronic, so any extended research means consulting books in a library. Although librarians have been experimenting with e-books for many years now, we still have not worked out how to best make e-books available. Our e-book collection to Lampeter was always very cumbersome to use, and the digital rights management in packages like Adobe Digital Editions makes the borrowing of e-books very fiddly. We need an academic book equivalent of iPlayer, which would enable me to be able to borrow academic books as easily as I can download a biography from Amazon on my Welsh bus. 3. Likewise, I find it frustrating that I can’t so easily share books I am enthusiastic about with my friends if the books are in electronic form. Amazon has a mechanism for lending e-books to friends, but I must admit I haven’t yet used it, and not all my friends are as keen on e-reading as I am. 4. 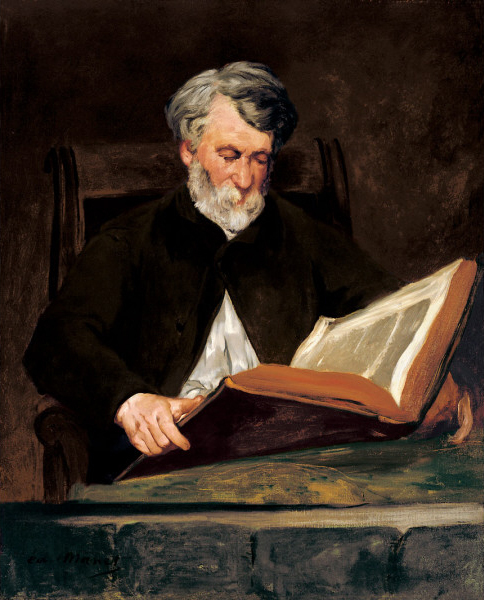 Although older books are readily available in electronic form through the Internet archive or Project Gutenberg, I must say that since I became an e-reading convert, I think I read many more recently published books - not necessarily a good thing, I think. However, much as I enjoy my e-reading, I am increasingly struck by how untransformative it is. I use my phone or tablet very happily for activities I did before using a variety of devices: listening to the radio, checking e-mail, watching movies, hearing music, taking photographs, reading. But I don’t use my phone for anything that I didn’t do before. This leads to my final reflection. Pleased though I am with e-books, they are very boring products. You just get an html presentation of the book’s text. The illustrations are tucked away at the end - there aren’t even any hyperlinks from the text to the illustrations. I recently bought an e-book in which the illustrations are left out. But part of the exciting thing about the digital medium is the opportunity to have much more richly illustrated texts. When I read about medieval manuscripts I want lots of pictures of them. But, all too often, my e-book is just bare text - the Thames and Hudson paperback on The Medieval Papacy that I bought in 1974 was much more richly illustrated than my e-book. One of my dystopian fears for our digital future is that it will turn out to be populated by pdfs of journal articles. All the potential richness of the digital medium will have been ignored in favour of producing homogenised factory production line scholarship. And, while I retain my e-book enthusiasm, what I want is more books like that being currently produced by Tim Hitchcock and Bob Shoemaker, based on their work on the Old Bailey Proceedings, which will allow the reader access to the records and documents on which the book is based. I understand that the production process for this book has been difficult and protracted, but it is precisely the possibility of presenting books in a different way that makes a digital environment exciting, and I hope that the future of e-books will be more media rich and varied than the plain and frankly crude html wrappers with which we are presented at the moment. This was a contribution to a plenary panel at the European Policy on Intellectual Property conference organised by CREATe at the University of Glasgow in September 2015. In the nature of a short contribution to a panel on a wider theme, it barely scratches the surface of the possibilities implied i the title, but here it is for the record. It is already very evident from our discussions here that a distinctive feature of research into intellectual property is the emphasis on historical understanding. Petra Moser’s keynote yesterday was a wonderful illustration of how intellectual property researchers find historical data which has a wider cultural significance and is more than simply a lab for exploring different models of access. It may seem that, since big data is meant to present issues of scale and potential that we haven’t encountered before, historical perspectives won’t be particularly helpful. What I want to suggest here that we perhaps need to widen our historical terms of reference, and not restrict ourselves to precise historical precedents and analogies. Sometimes, big data requires big history (although we should also be aware of the caveat of Tim Hitchcock about the dangers of thinking exclusively on a large scale — we need both microscope and macroscope). Let’s go back a long way, to 1086, when William the Conqueror, who had won the English crown at the Battle of Hastings twenty years previously, gave orders that a detailed survey should be undertaken of his English dominions. The Anglo-Saxon chronicle described how William sent his men to every county to enquire who held what land. The chronicler was horrified by the amount of information William collected: ‘So very thoroughly did he have the inquiry carried out that there was not a single hide, not one virgate of land, not even — it is shameful to record it, but it did not seem shameful for him to do — not even one ox, nor one cow, nor one pig which escaped notice in his survey’. Collating all this information required William’s clerks to develop innovative data processing techniques, as they prepared a series of summaries of the data, eventually reducing it to two stout volumes. The motives of William in collecting this information are still debated by historians, but the data was immediately put to use in royal courts and tax collection. Within a short period of time, this eleventh-century experiment in big data had become known as Domesday Book — the book of the day of judgement, from which there is no appeal — just as there can today be no appeal from the algorithms that might be used to set our insurance policy or credit rating. Domesday Book was the first English public record and is a forcible reminder that anxieties about government data collection are nothing new. 2015 marks the anniversary of the grant of another celebrated English public document, Magna Carta. King John is remembered as the tyrant forced to grant Magna Carta at Runnymede, but his reign was also important because many of the major series of records recording government business began in his reign. John’s reign saw an upsurge in the use of technologies of writing and mathematics in the business of government. One important thread in the Magna Carta story is that it was both a reaction to, and at the same time an expression of, this growth in new technologies of government. It’s intriguing that Tim Berners-Lee and others have called for a Magna Carta for the world wide web to address issues of privacy and openness. There are a number of problems with this. One is, of course, that Magna Carta is linked to a common law system — it hasn’t even been adopted by the whole of Britain, as Scotland with its roman law system has always had a semi-detached relationship with Magna Carta. The other is that granting that the embedding of Magna Carta in English political life was a complex process, spread over several centuries and involving two civil wars. In considering the issues of governance, ethics and identity posed by big data, this kind of longue durée approach can be very helpful. Jon Agar’s wonderful book, The Government Machine: A Revolutionary History of the Computer describes how the conception of the modern computer was influenced by the type of administrative processes developed by government bureaucracies in the nineteenth century which sought to distinguish between high level analytical policy work and routine mechanical clerical labour. Charles Babbage’s work was a sophisticated expressions of this nineteenth-century urge to identify and mechanise the routine. Closely linked to this urge to mechanise government was a concern, in the wake of the industrial revolution and the growth of population, to gather as much statistical information as possible about the enormous changes taking place. In a way, data can be seen as an expression of modernity. Another key big data moment was the 1890 United States census when the huge quantity of data necessitated the use of automatically sorted punch cards to analyse the information. 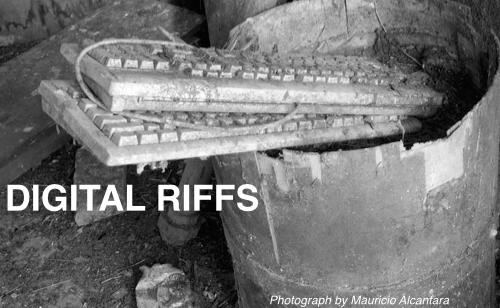 Jon Agar vividly describes the achievements of this analogue computing and the rise of IBM. His account of the debates surrounding the national registration schemes introduced in wartime and the anxieties about linking these to for example employment or health records illustrate how our current concerns have long antecedents. However, I think looking at big data concerns in this way does more than simply remind us that there is nothing new under the sun. It is also helpful in clarifying what is distinctive about recent developments and in identifying areas which should be policy priorities. First is the ubiquity of data. For governments from the eleventh to the twentieth century, data was something gathered with enormous clerical and administrative effort which had to be carefully curated and safeguarded. Data like that recorded in Domesday Book or records of land grants was one of the primary assets of pre-modern governments. Only large organisations such as governments or railroad companies had the resources to process this precious data — indeed one of the changes that is very evident is the shift in processing power, and perhaps we should be talking more about big processing rather than big data. Data was used in order to govern and was integral to the political compact. Now data is ubiquitous and comparatively cheap to acquire and process, this framework of trust no longer applies. Moreover, the types of organisations deploying data have changed. In particular, it is noticeable that the driving forces behind the development of big data methods have frequently been commercial and retail organisations: not only Google and Amazon, but also large insurance, financial and healthcare corporations. This is a contrast to earlier developments, both analogue and digital, where governments have been prominent and private sector involvement more limited. The Oxford English Dictionary draws a distinction between the term big data as applied to the size of datasets and big data referring to particular computational methods, most notably predictive analytics. Predictive analytics poses very powerful social and cultural challenges, especially as more and more personal data such as whole genome sequences becomes cheaper and more widely available. How far can your body be covered by existing concepts of privacy? And is the likely future path of your health, career and life a matter of purely personal concern? In many ways, it is this idea of prediction which most forcibly challenges many of our most cherished social and cultural assumptions. Predicitive policing — an early contact by the police with people considered likely to commit crimes — is already being tested in some American cities. Predictivity almost dissolves privacy because it shifts the way in which we look at freedom of choice. It starts to become irrelevant as to what my reading or music choices are if they can be readily predicted from publicly available data. How we cope with a society in which many of our actions can be predicted is one of the chief challenges posed by big data. As my colleague Barry Smith, from the AHRC’s Science in Culture theme, has emphasised, the neuroscience surrounding predictivity — the way in which the brain copes with this predictivity — will become a fundamental area of research. As predictive analytics shades into machine learning, these questions will become even more complex, since we will start to see the distinction described by Agar between analytic work and routine labour breaking down in large organisations, posing major social and cultural challenges. Finally, it is worth noting that generally the most important large data sets (censuses, tax records) have been about people, but increasingly big data will become about things. For example, machine tools frequently have sensors attached to them which enable the state of the tools to be monitored remotely by the manufacturer. This might encourage the manufacturer to monitor use of their products by clients in ways that could have commercial implications. The monitoring of medical implants will raise even more complex issues. A hint of the kind of complications that these developments might raise was given in the concurrence of Justice Alitto in the US Supreme court judgement in US v Jones 2012, which concerned the use of GPS tracking devices by police. Struggling to imagine how the framers of the US constitution would have viewed such devices, and imagined the analogy of ‘a case in which a constable secreted himself somewhere in a coach and remained there for a period of time in order to monitor the movements of the coach’s owner’. For the Anglo-Saxon chronicle complaining about Domesday Book, the objects of the king’s greed were evident: land and animals; our future anxieties may be very different because our chief anxiety may be about objects linked to us in much more distant and complex ways.